With Specialized Scard. Apply in store. On in-store purchases with no minimum on your Specialized Scard. What is the Specialized Scard credit card? 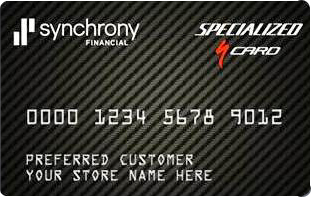 Specialized offers customers a credit card through Synchrony bank with a revolving credit line to use again and again at participating Specialized dealers. How do I get a Specialized Scard credit card? You can apply for a Specialized Scard credit card at any of our convenient locations. How can I make a payment on my Specialized Scard credit card? Specialized offers three convenient ways to pay your Specialized Scard credit card bill.